Cushing's disease can be difficult diagnose. The disease typically surfaces in a dog's later years, and the symptoms are amazingly similar to the many aches, complaints, and loss of vitality and function that most dogs face as they enter old age. This disease is progressive and can be fatal, so it's a good idea to familiarize yourself with it for your pet's sake. Cushing's disease, scientifically referred to as hyperadrenocorticism, is caused by a disruption in the brain's normal communication process. The hypothalamus is the part of the brain that directs the pituitary gland to produce and distribute the adrenocorticotrophic hormone (ACTH). ACTH, in turn, signals the adrenal glands to produce a secretion known as glucocorticoid, a substance also referred to in layman's terms as "cortisol." The trouble begins when more cortisol is produced than the body can utilize because cortisol suppresses the immune system. This can lead to a host of health problems including heart disease, liver failure, kidney failure, blood clots and infections. According to VCA Animal Hospitals, there are three types of Cushing's, and each has its own cause. Pituitary tumors can cause the gland to produce a constant flow of ACTH, forcing the adrenal glands to keep up cortisol production. This form of Cushing's disease in dogs is known as Pituitary Dependent Hyperadrenocorticism, and can be somewhat detected by the enlarged state of the adrenals. Adrenal gland tumors can also be the source for the disruption in communication between the hypothalamus and the glandular systems, again resulting in the overproduction of cortisol. Adrenal based Cushing's may be suspected when there is a considerable size difference between the two adrenal glands. Giving external sources of glutocorticoid, such as steroids used to treat allergies, can artificially boost cortisol production, and sometimes leads to the onset of Cushing's symptoms. This medically induced form of Cushing's, referred to as Iatrogenic hyperadrenocorticism, suppresses normal adrenal gland activity, causing the glands to become small and atrophied. Cushing's disease can be hard for owners to recognize because the symptoms are quite typical among aging pets and come on gradually. Perhaps the biggest clue would be finding more than one of these symptoms presenting at the same time, especially in a dog that would normally be considered middle aged. 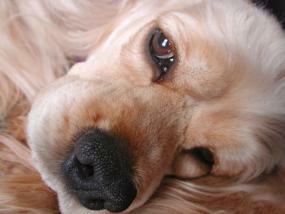 Cushing's can also lead to the onset of canine diabetes, as well as kidney or liver disease. Diagnosing Cushing's disease is easier said than done. As previously mentioned, a grouping of symptoms is usually the first clue, and X-rays revealing the current conditions of the pituitary and adrenal glands can also help diagnose the disease. According to the Washington State University College of Veterinary Medicine (WSUCVA), there is no single, definitive test for the condition, but there are some specific tests that can point veterinarians toward a diagnosis. A dexamethasone suppression test - There are two versions of the test, a low-dose test and a high-dose test. The appropriate dosage of dexamethasone is administered, and then the vet will draw blood at set times to measure the amount of cortisol in the bloodstream. A urine test - This test is used to determine current cortisol/creatinine ratios. An ACTH stimulation test - This test involves getting a baseline cortisol reading before injecting ACTH, and then recording the adrenal gland's cortisol production response. According to WSUCVM, treatment is based on the type of Cushing's diagnosed. Pituitary-dependent Cushing's is mainly treated with various medications. Lifelong treatment with the drug Lysodren is usually necessary. This drug is typically given at a higher frequency during the initial "induction" period, and then the dosage is reduce to once or twice weekly. Lifelong treatment with the drug Trilostane/Vetoryl may also be an effective treatment. According to the FDA, this drug stops the production of cortisol in the adrenal glands. Anipryl/L-Deprenyl is one of the newer drugs used to treat this disease. According to 1-800-PetMeds, this drug works directly on the pituitary gland to suppress it. Adrenal-dependent Cushing's is mainly treated with surgery and medication. Surgical removal of adrenal gland tumors is often very effective. Treatment with Trilostane/Vetoryl is used in some cases, and is similar to treating the pituitary-dependent form of the disease. Depending on the exact cause of Cushing's, the disease is treatable, but it isn't always curable. Most dogs diagnosed with this disease will need medication for the rest of their lives, as well as routine blood monitoring to make sure the medication remains effective and doesn't produce severe side effects.